My Smart TV and PS3 both struggle to support certain codecs. They both fail as a complete digital media player. I decided to have a play with XBMC to create a networked media device that would play anything I throw at it. The main storage source is currently a Windows 7 PC on a gigabit network. A basic HTPC does not require a very powerful computer. I am going to attempt this with some old computer parts that I had laying around. The new Intel NUC is a popular choice. Some people like the Raspberry Pi or Android based devices. I’ve tried three separate XBMC setups on this computer. XBMC on Windows 7, XBMCbuntu and OpenELEC. Long story short, Windows 7 and XBMCbuntu did not perform well. I ran into almost constant issues with freezing and poor performance – started to think the old components were to blame. After hours of frustration, I stumbled on OpenELEC. 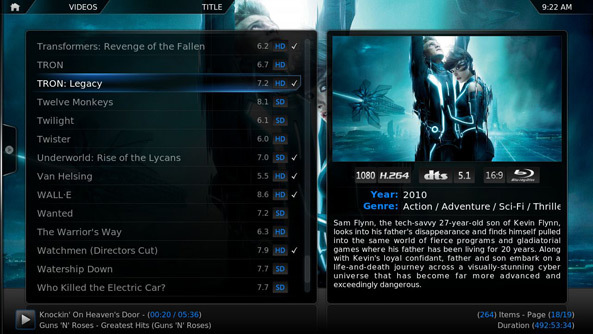 OpenELEC is a standalone Linux distribution for XBMC. The installation is tiny, and it runs on my old computer perfectly. I chose the Generic image of OpenELEC for this computer, as it is Intel based with an Nvidia video card. To my surprise, everything worked out of the box. There was no performance issues at all. I did have some issues installing OpenELEC. The motherboard was unable to read the Live USB. PLOP Boot Manager on a CD-ROM was required to force USB 1.1 and the flash memory had to be smaller than 2GB for it to successfully boot. The Harmony remote worked out of the box using the Windows Media Center preset provided. I have made some small customisations that I wont go into here. If you don’t have a remote or IR receiver, XBMC has an Andriod and iOS App that works over Wi-Fi. The computer goes into an S3 sleep state, and runs only the bare essentials to reduce noise and power consumption. The possibilities are endless. I would like to move the computer into a slimline HTPC case one day. For more information about how to configure OpenELEC see the Wiki. One note to avoid confusion, you will need to SSH (I used Putty) to access restricted terminal functionality over your home network. If you want to get under the hood.